Add a Drink to Express Meal for £1 at Bar + Block Available 11:30am - 5pm, Monday - Friday! Whether you want to kick-start your weekend with a delicious brunch, pop in for a mid-week lunch treat or take some time out with a loved one to tuck into a tasty dinner, Bar + Block has got a menu that’ll fulfil all your foodie desires! Contemporary takes on classic favourites is what you’ll find, think steak and eggs, burgers with Mexican vibes, grills and many more options to really take your hunger on. The Bar + Block menu is one that’ll always stay fresh and with the times, plus, there’s plenty available for vegetarians too so this is an all-round pleaser! Bar + Block will most especially impress steak fanatics, those who know their Sirloin from their Ribeye, to be precise. Simply choose their favourite cut, and whether you adorn your fillet or rump steak with their signature ‘B’ sauce for a spicy kick, with the old favourite peppercorn sauce, or with prawns for a surf and turf vibe, you’ll enjoy that powerful flavour hit. Wash it down with a Malbec or two, however you order at Bar + Block, you’ll enjoy a vibrant and memorable meal. How do I use my Bar and Block voucher? Choose a voucher for Bar + Block on vouchercloud and save your offer to use in-store or head to the Bar + Block website using our link to book a table. Choose your location then click ‘Book’ and fill in the necessary details, be sure to mention the voucher or offer you wish to redeem on booking if available or on arrival and be sure to read the Terms & Conditions. You can sign up for offers and promotions from each Bar + Block homepage! How do I get to Bar + Block? You can find directions and a Google Map view too on each of the Bar + Block location pages under ‘Find Us’. Are there gluten-free options at Bar + Block? There is a full allergens menu to reference online and plenty of gluten-free dishes to choose from. Does Bar + Block take group bookings? For groups of 6 or more, we recommend contacting Bar + Block directly to make a reservation. You will be emailed a booking reference once your table has been confirmed. You may cancel your reservation at any time by getting in touch with the individual restaurant. You can submit a query or leave feedback for Bar + Block online. To contact restaurants directly, you can find the relevant address and phone number under the ‘Find Us’ tab. If you’re into succulent steak, a little gastro cuisine and a fusion of flavours, Bar + Block has a sumptuous menu just waiting to impress you. With restaurants in Birmingham, Bath, Kings Cross and Whitley too, book your table with a Bar and Block voucher to save on an exquisite meal to remember. 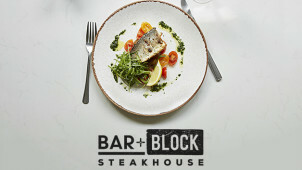 From sizzling starters to delicious burgers, steaks and vegetarian options too, Bar + Block adds a tangy and contemporary twist to classic favourites and this casual cool restaurant is where you can bask in great food, a friendly atmosphere and fabulous company no doubt. You can visit the ‘Bar + Block News’ section online to get a sneak peek at the goings on behind Bar + Block. From new menu additions and happy Bar + Block reviews to offers and new restaurant openings - this is where you’ll get the lowdown on great beer, cocktails, puds and seasonal additions to taste alongside the secret (not the whole secret), behind their speciality dishes! What better to go with a tender and mouth-watering steak, than a cheeky cocktail? Bar + Block are quite the connoisseurs, conjuring up delectable tipples for all to enjoy. Get your Old Fashioned or classic Cosmo for less with your Bar and Block discount and you’re sure to have a grand time. Great to enjoy with friends and family too, you can be sure to make every Bar + Block visit an epic one when it’s rounded off perfectly with a cocktail.